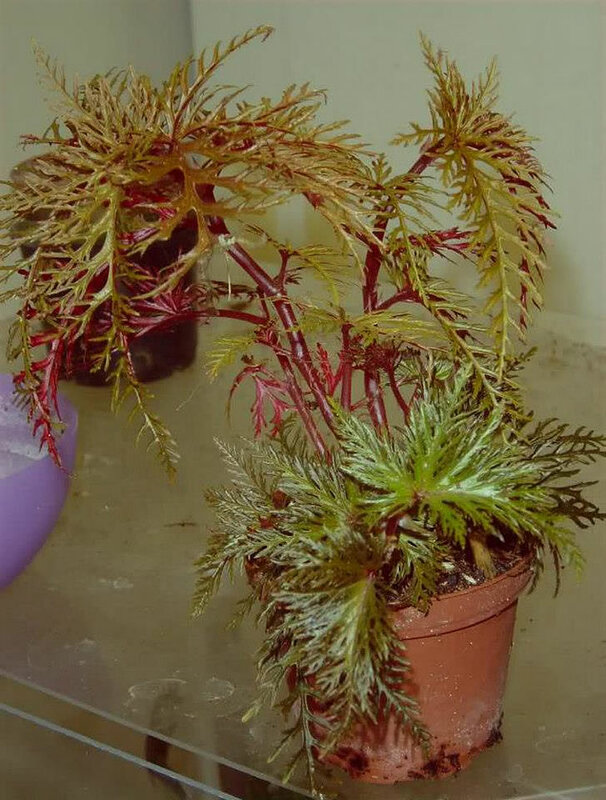 Distribution and habitat: Begonia bipinnatifida is a species with a fern-like leaf appearance from New Guinea. It was found in primeval forest growing high on Mount Horne in rocky places. 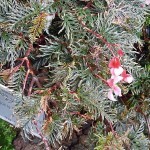 It has a shrub-like growth habit and can get 25 to 30cm (10-12 inch) tall. The name bipinnatifida comes from the Latin bipinnatus which means twice pinnate. Description: Begonia bipinnatifida is shrub-like with erect and semi erect deep red stems that are branched. The deep red stems are somewhat zig-zag from thickened node to thickened node. Average mature leaves measure 13cm (5 inch) in length and 5cm (2 inch) wide. The upper surface of the leaves is deep green; in contrast, the undersurface is deep red. Leaf shape is obliquely oblong-ovate with an acute apex and an obliquely obtuse or slightly semi-cordate base. The leaf is deeply twice-divided outward on both sides of the deep red midrib into twelve to sixteen narrow taper-pointed divisions. Each division of the pinnate leaf is also pinnate: this gives the leaves a fern-like appearance. Begonia bipinnatifida blooms infrequently and the flowers are tiny. The female flowers have five unequal pink tepals that are oblong or elliptic-obtuse. The styles and stigmas are golden yellow; threadlike erect styles are diverging and the velvety semi-crescent shaped stigmas are somewhat twisted. The deep pink ovary has three wings. Male flowers have two kidney-shaped pink tepals. Houseplant care: Begonia bipinnatifida requires high humidity; this can usually be accomplished in a greenhouse or a terrarium. Careful watering and regular fertilizing are important. It can be a challenging species to grow but given the correct growing environment and care it grows into an outstanding species to enjoy. Light: Begonia bipinnatifida plants are recommended to be grown in contained atmosphere (terrarium) under horticultural fluorescent lights. They require particularly bright light, therefore they need to be closed to the centre of the light where light levels are most intense. Timers may be used to provide 14 to 16 hours of light a day. Alternatively, plants grown under natural sunlight on a windowsill will often perform best when provided with a south facing position in winter and est-facing one in summer. However, care should be taken if the plants are grown in glass containers to not overheat them by placing them on windowsill. 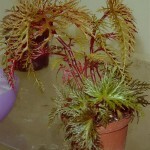 Temperature: Normal room temperatures are suitable for actively growing Begonia bipinnatifida. Overwinter these plants at no less than 13°C (55°F). This species tolerate temperatures between 10 to 35°C (50-95°F). 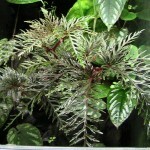 Rise the air humidity around the plant when not grown enclosed in a terrarium. Begonia bipinnatifida will need relative humidity around 70%. Because it likes a very humid atmosphere, in cultivation Begonia bipinnatifida is usually grown in an enclosed grass container. Terrariums should be placed in cool places to not overheat the plants, as the temperature could building up in enclosed containers. Additionally the temperature inside the terrarium can be reduced by setting the lights to come on only at night time when conditions are usually cooler. A fan can also remove any excess of heat produced by the lights. Watering: Water actively growing Begonia bipinnatifida plants moderately, allowing the top couple centimetres (0.8 inch) of the potting mixture to dry out before watering again. During the winter rest period water more sparingly, allowing the top half of the potting mixture to dry out between waterings. Plants grown in contained atmosphere will need less watering then those in other situations. The only way to determine when to water is to touch the surface of the growing material to feel how moist it is. Water only when it become dry by spraying them with a fine mist. Rain or distillate water is preferable. Sealed containers will need watering only a few times a year. If a particularly dense build-up of condensation occurs on the inside of the container soon after watering, it means that too much water has been added. Use paper towers to remove the excess of water and leave the lid off for a few hours to correct the problem. 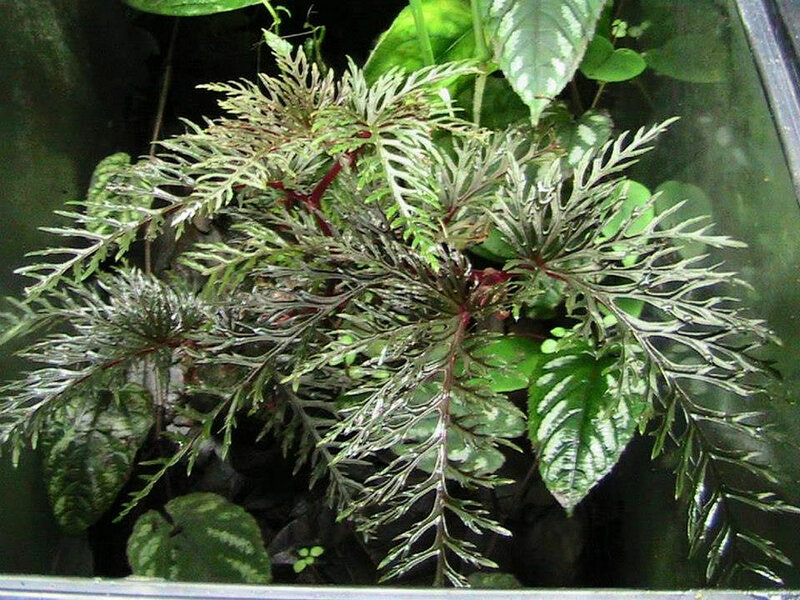 Feeding: Fertilising Begonia bipinnatifida grown in terrariums is rarely necessary. Otherwise, apply standard liquid fertiliser every two weeks to actively growing Begonia bipinnatifida plants. Soilless potting mixture will need more frequent fertiliser applications than most soil based potting mixtures. Move the plants into pots one size larger every spring until maximum convenient pot size has been reached . Thereafter, top-dress annually with fresh potting mixture. 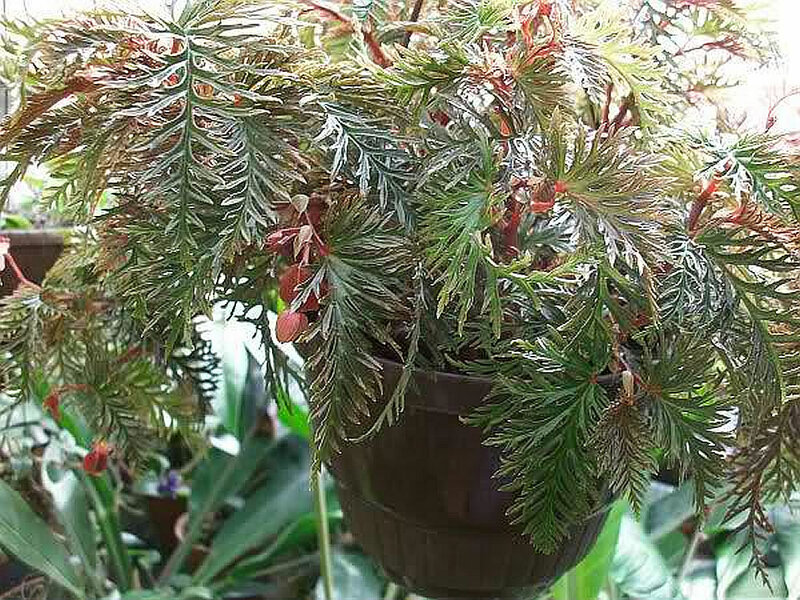 Do not overpot Begonia bipinnatifida plant, otherwise excessive moisture may accumulate in the potting mixture and cause the roots rot. When potting and repotting these plants, simply sprinkle some mixture around the roots and tap the container briskly to settle the mixture. Do not firm it down with the fingers. 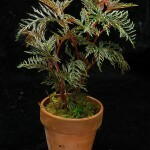 Also Begonia bipinnatifida plant can be grown in terrariums. The growing medium should be composed of chopped, long-fiber sphagnum moss and a small amount of perlite. Prepare the sphagnum for the mix by immersing it in boiling water to sterilize it, allow it to cool, then cut it with scissors into roughly 2.5cm (1 inch) pieces. Blot the wet sphagnum with a paper towels to remove any excess of water before mixing it with perlite. Place a thin layer of charcoal, about 0.5cm (0.2 inch) in the bottom of the terrarium to absorb soluble salts and other impurities before they have the chance to damage the roots. Add a layer of 2.5 to 7.5cm of the prepared growing medium mix. This medium will be enough moist, no additional water after planting is needed. Check annually the pH of the growing medium. If the pH has fallen below 5.8, ground limestone may be gradually worked into the growing medium until the pH is raised to correct level. Propagation: Begonia bipinnatifida are fairly easy to propagate from cuttings (even leaf cuttings). As usually is grown in terrariums, propagate this plant by simply taking a cutting and putting it right in straight sphagnum, keep it moist, but not too wet, medium to high light and very humid.The cuttings will root generally in three to four weeks. Treat the rooted cutting as a mature plant, but do not move it until it has been well established, showing significant new growth. 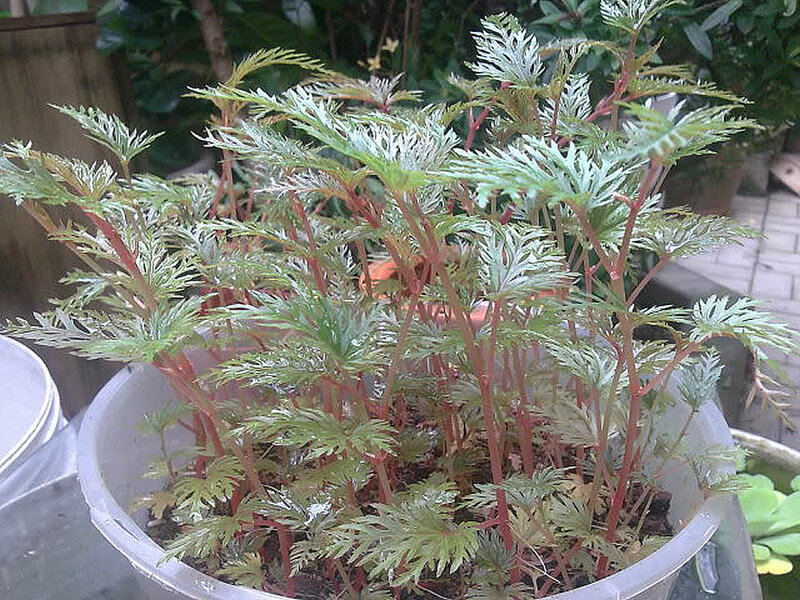 Begonia bipinnatifida plants grown in pots are normally propagated from 5-8cm (2-3 inch) long tip cuttings of new growth taken in late spring or summer. Trim each cutting immediately below a leaf, dip the cut end in hormone rooting powder and plant it in 5 or 8cm (2-3 inch) pot containing a moistened equal parts potting mixture of peat moss and coarse sand or perlite. Enclose the whole in a plastic bag or propagating case and stand it in bright filtered light. After rooting occurs (generally in three to four weeks), treat the rooted cutting as a mature plant, but do not move it into the recommended potting mixture for the mature plants until it has made at least 7cm (3 inch) of top growth. Begonia bipinnatifida is particularly prone to powdery mildew. All progeny hybrids are prone to this fungal disease. Mealy bug will appear on Begonia bipinnatifida plants in abundance before they show up on nearby plants. All its hybrids are prone also to these bugs. 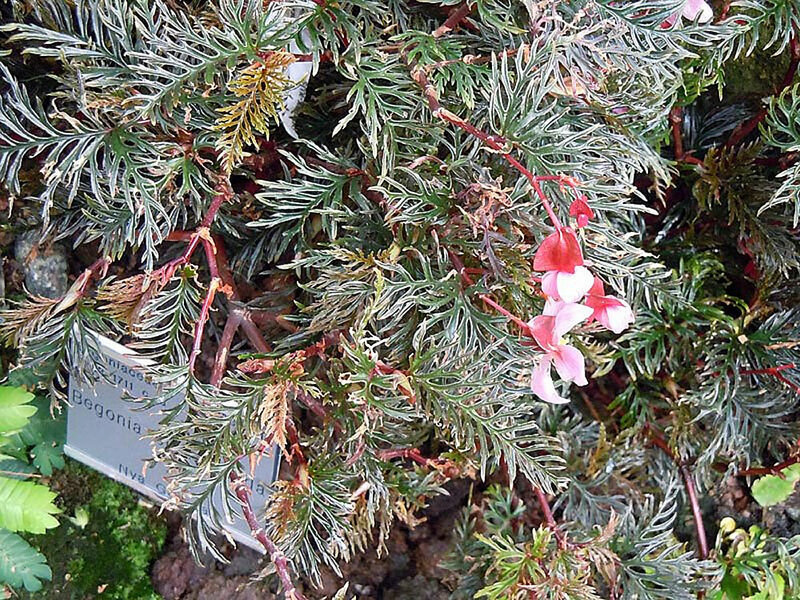 A number of tiny mite species can be problematic for Begonia bipinnatifida. Infested leaves are yellow speckled and, if the infection is severe, may be covered with wool like substance on their undersurface. Treatment: The best form to control is to destroy affected plants. 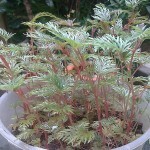 In open garden avoid replanting Begonia bipinnatifida in contaminated soil. In case of potted plants, infestation may be prevented ans controlled by routinely using sterilized potting mixtures and washing the plant pots. Scale insects may feed on Begonia bipinnatifida plants. Note: For botanical classification Begonia bipinnatifida is placed in the section Petermannia with Begonia species with like characteristics. 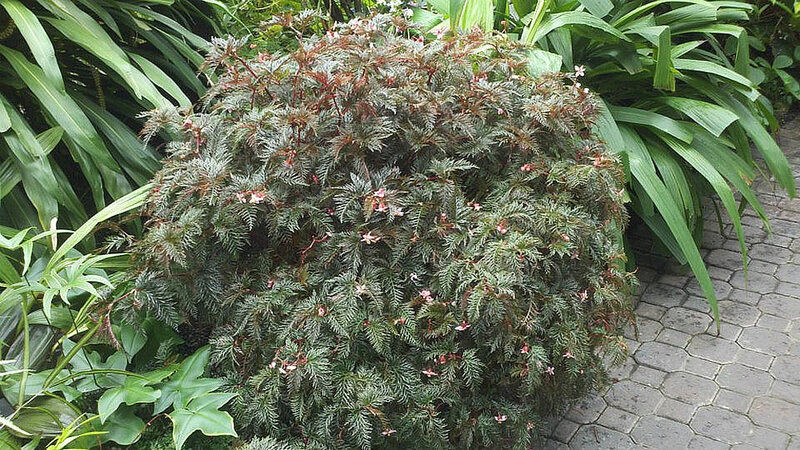 Botanic name: Begonia bipinnatifida J.J.Sm. Availability: This plant native of Papua New Guinea has been known for almost a century but is not common in collections. 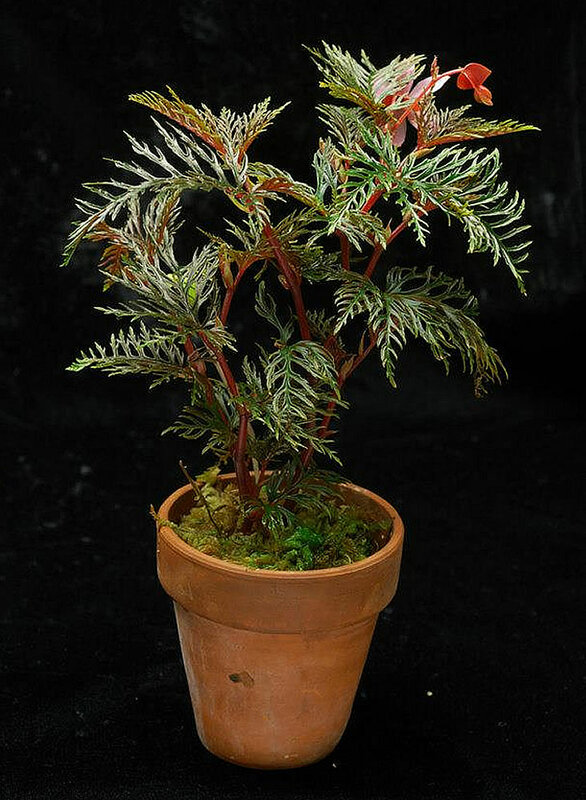 Begonia bipinnatifida is a rare type of Begonia which is ideally suited for a terrarium. 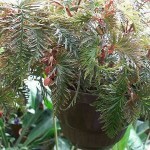 This plants are available for sale in small pots and may be shipped bare root, in sphagnum or still potted. Uses and display: Begonia bipinnatifida can be grown in a hanging basket, windowsill pot or even planted in ground in a bright shade and humid area within its hardiness zone. But the most suitable way to grow this amazing plant is to plant it in a terrarium or to place it in a greenhouse where the high requirement for humidity can be achieved.